Several families who have received rapid re-housing subsidies marched with advocates on May 9 to voice their concerns about the program. 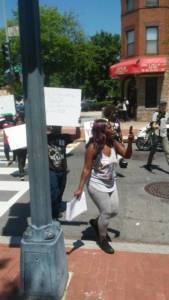 Meeting at the Virginia Williams Family Resource Center on Rhode Island Avenue, they marched nearly two miles in the heat to the headquarters of the D.C. Department of Human Services, where they delivered a letter to DHS officials. As a former rapid re-housing recipient, I see the importance of having a robust conversation about the program, which can be strengthened by input from the community. Right now, the city relies on rapid re-housing to promote movement within the homeless-services system, primarily for families and veterans experiencing homelessness. Theoretically, the program is for those who need the least assistance, but reports show that most families and individuals matched to rapid re-housing need more services than the program currently provides. Concerned residents across the city have increasingly been discussing rapid re-housing and its effectiveness in battling housing instability. 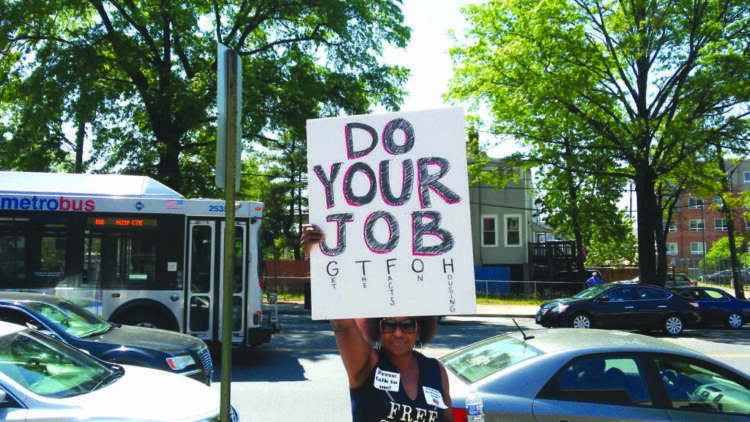 “We don’t deserve to be treated like trash,” one resident said as the group gathered outside the Virginia Williams center earlier this month. The city’s rapid re-housing program provides a one-time rental subsidy for up to one year. However, many are concerned that the program is not having the desired outcome and lately, the city government has been criticized for continued investment in the program. Last year, the Washington Legal Clinic for the Homeless published “Set Up to Fail,” a report that highlights some program participants’ inability to retain housing after the subsidy ends. “I am fighting for more Targeted Affordable Housing for people in poverty because rapid re-housing does not meet the needs of people who are facing homelessness,” said Travonna Brooks. Brooks has gone through the rapid re-housing program and co-organized the demonstration on May 9 to fight for families like hers. Targeted affordable housing is a rental subsidy program designed for long-term use. 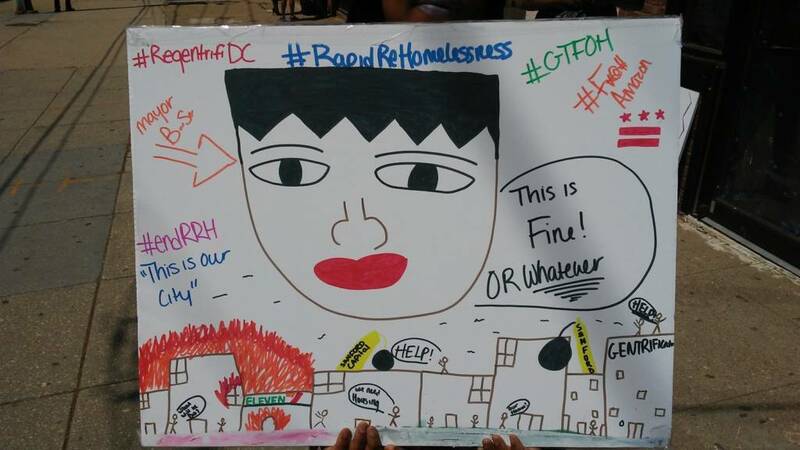 According to the letter that marchers delivered to DHS, recipients of rapid re-housing funds can have a hard time finding landlords who will accept them, given the time limit of the voucher support. The letter also outlined minimum income and credit-score requirements as barriers to finding apartments, despite the government-funded voucher. Above all, they said that one year was not enough time to find adequate employment to cover rent when the subsidy expires. The 15-point list of demands in the letter asked for an extension of the time limit, more career-development assistance, a handbook to help navigate the program, and oversight from an entity outside of DHS. When the marchers arrived at the Department of Human Services, they approached the front desk and asked to speak directly with DHS Director Laura Zeilinger, who was unavailable. However, several staff members from the department met with the families and their advocates in the lobby. The DHS representatives tried to speak with the families one-on-one, but they refused. “We don’t want to play backroom politics,” said one woman. The department had previously been in touch with the families and asked to schedule a meeting with Zelinger and other staff to “have a constructive conversation, identify solutions to their concerns and raise awareness to things we’ve already done to improve the program,” according to Dora Taylor-Lowe, the department’s public information officer. The letter requested a written response to each demand by May 16, as well as an in-person meeting to discuss the responses. Suggested deadlines were placed alongside each item on the list. The group of families and representatives from the Washington Legal Clinic for the Homeless met with Zeilinger for roughly two hours on May 14, according to Taylor-Lowe. As Street Sense went to press, DHS was planning to issue written responses by the requested deadline as well as have program staff call each household individually to investigate their needs.